I’ve had better weeks. I’ve had worse… but I’ve definitely had better. You know when your week is kinda going ok, and then it starts to take a turn for the worse? First it’s one sorta small mildly unpleasant thing, and then it’s like a medium not-so-good thing. Then boom, boom, it’s two blatantly sucky things back to back, and you start looking around for an explanation? As part of my investigative process, I usually pull up the full moon calendar. There is seriously something to it. For the first three years of his life, Zachary would be up all night fussing the two nights leading up to the full moon. EVERY month for three years. After a while, John could not argue with my hypothesis anymore, as much as he wanted to. The moon pulls on the ocean, I know it can screw around with our tiny little bodies & mess with our heads and make us cranky and irritable. C’mon, I know it’s not always the moon that gives us grief. It is fun, however to think of the moon as an adversary. Whaddaya gonna do – throw down with the moon? When you’re mad, and feeling kinda beat up, I’m sure you notice that everybody else’s driving is really terrible. Then I look at myself, and I see that I’m hunched over, chin all the way over the steering wheel, knuckles white, in my best defensive driving position. I’m sure if you peeked in the window, I’d look Cruella De Vil driving that crazy car of hers, wild hair, gangly arms, lips thin and growly. I don’t have that cigarette holder or a puppy fur coat though, so I’ve got that going for me. I just want to get home and hide. I want to pull the drapes and turn off the phones. I’ll drag the sleeping bags into the living room and let the boys watch a movie and eat dinner picnic style, just so I can feel cozy and protected from the maniacal villains who are running around loose out there, intent on making me miserable. I know by now that you can’t control people – that never ends well – so I will try my darnedest to control things from within the house. The laundry. The dishes. That candy shelf. The photo cabinet that is currently sitting open because I was going to pour all of my frustrations, and swear words that I wanted to say, and dirty looks that I wanted to give into reorganizing that horrible horrible closet. And I wanted to sit down and write something funny about anything, but every opening line I typed sounded like the beginning of a manifesto. Reading’s good and takes my mind off things, but the book on my nightstand is The Girl with the Dragon Tattoo. I’ve been trying for months to read it, refusing to pick up another book until I finish. Actually, I angry like Hulk every time I pick it up, because I can’t get past all the Swedish, and it makes me feel dumb. I really should just quit trying. I tossed aside Eat, Pray, Love after the Eat part and never looked back. Then there was the added bonus of one less Julia Roberts movie I felt obliged to see. When you’re mad, like really good and mad, there are few practical ways to dissolve the anger. A choose-your-own- adventure of sorts. Part of being an adult, a responsible, thoughtful, and prayerful person, is to select the right adventure. Sometimes I goof and pick “rant”. I’m spoiled rotten that I have people who will listen and be patient with me. That my husband, who even out in the mountains of Idaho, will drive two miles just so he has better reception to hear me gripe. And that I have amazing friends, who on any given day, if I hint the slightest that I’m upset, will text and call to say that even though they don’t know the story, they’re mad too, on my behalf. Or, sometimes the adventure starts with yelling, stomping, muttering, crying, or the unfortunate combination of all of the above. Moses finally had it, let his fury get the best of him, struck that rock with his staff and was kept out of the from the Promised Land, even after all that work and all those years of being obedient. Fine. I guess I’m supposed to get my you-know-what together, let go of my worries and fretting and the anger that for some reason I seem to enjoy holding on to. Surrender. Bluch, really? Do I have to? It’s not like I’m trying to take it out on everybody else so they’ll feel terrible too, right? Right? Surrender is not very glamorous. I’ll try, but I’m telling you right now, it’s not easy. I’m pretty sure it’s my least favorite option. Channeling anger into an activity that’s obviously counter-productive can be fun and bring relief, even if it’s temporary. 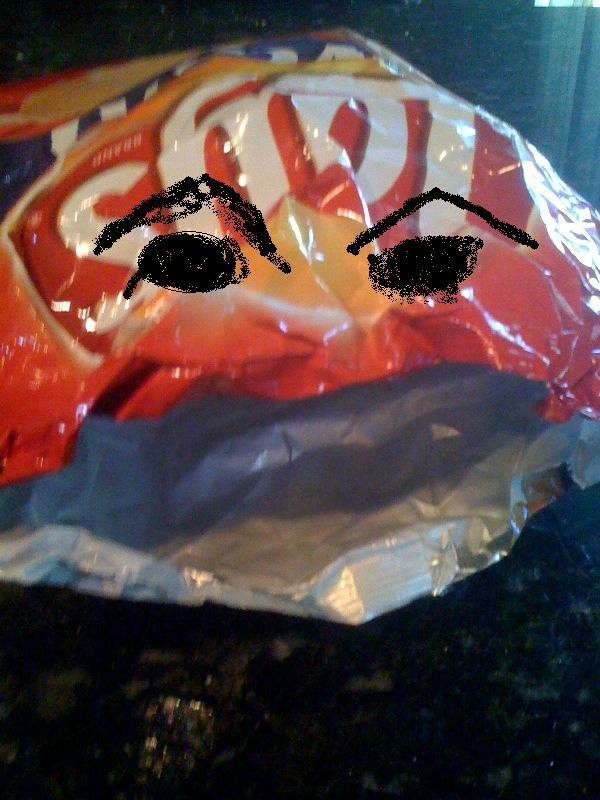 I can rage-eat a bag of Wavy Lay’s like nobody’s business. It feels fan-flippin-tastic at the moment, but does it feel better later? Definitely not, especially since, in a blind fury, I probably also whipped up a batch of clam dip to go with it. Like yelling, like crying, like complaining – the joy of clam dip furiouso is fleeting. Sounds like you are working through it 🙂 Love it, as usual. I feel you. I rage clean. And you can always tell when life is golden because the house is a pit. Ok, it’s MORE of a pit. Speaking of which, I need someone to come tick me off so I can get this house whipped into shape!! I can’t finish “The girl with the dragon tattoo” either. I feel kinda dumb because of it. ahhh… if you put some wine with those chips and clam dip that would be perfection…Love you, wish I was closer so we could rage eat together, rage, eat, love that’s the book we should write!